Séamus Wines now annually produces 2500 cases of ultra-premium, hand crafted California wines made with grapes from the very finest vineyards and appellations for each varietal we source. Because our winery is small, we live out our passion for creating superior wines by literally hand selecting hard-to-find vineyards for our grape portfolio based exclusively on quality, terroir, and our winemaker’s needs. Also, being small producers allows us to buy the best fruit from preeminent California vineyards without impacting their commitments to large customers. Being able to source exactly the fruit we want for each varietal allows us the control we need to provide you with the most select, delicious, luxury wines possible. 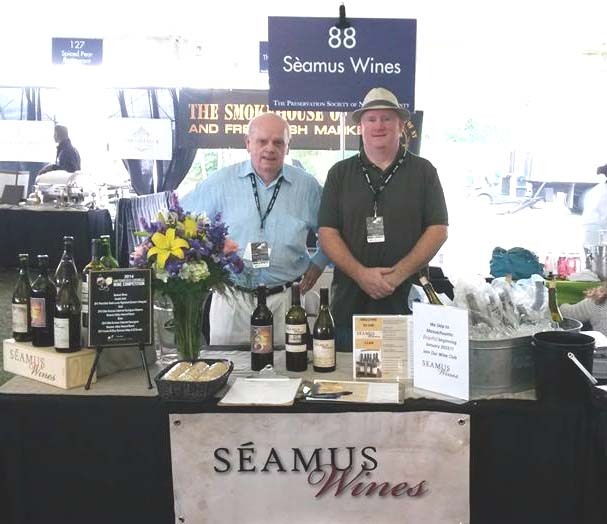 Séamus Wines is family-owned by father-son team James Foley, Senior and James Foley, Junior. Jim Sr. runs the business office, wholesale, and retail sales from Marietta Georgia while Jim Jr. over-sees grape acquisition, production, and winemaking in San Francisco and Sonoma, California. Séamus varietals include Cabernet Sauvignon, Pinot Noir, Chardonnay, Sauvignon Blanc, Pinot Gris, Merlot, Rosé, and a Cuvée blend. Our wines are served in many fine restaurants in California, Florida, Georgia, Louisiana, New Jersey, and Colorado. Currently our primary markets are in both restaurants and fine wine shops. Annually, we win medals for each of our wines. We do also sell our wines via our website and offer two great wine clubs direct to consumers. Séamus enjoys a reputation for consistently producing fine wines, handmade by our small but growing company. We are excited about our excellent status in the national winemaking community as it isn't easy for boutique producers to be known and appreciated to the extent we have now achieved through our awards. We are Alternate Proprietors at The Dog Patch Wine Works in downtown San Francisco where all of our wine is made. Once our wine is bottled, it is stored and shipped from Napa, California. We are very proud of what we have accomplished so far in the winemaking world and are excited to share our bright future and enchanting wines with you. Our customers become a part of our small family, and we thank you for your interest in us. Slainté! Jim Sr. and Jim Jr. are both literally "hands on". They are each available for tastings, wine dinners, ride alongs, etc., so please don't hesitate to call about anything! SEAMUS is an Irish name, pronounced "shay mus." Translated to English, it is "James,"